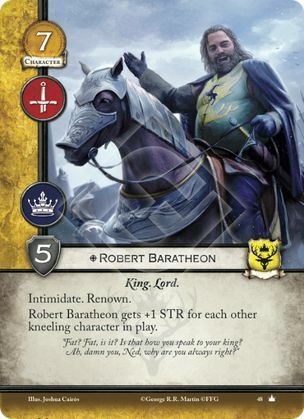 Robert Baratheon gets +1 STR for each other kneeling character in play. "Fat? Fat, is it? Is that how your speak to your king? Ah, damn you, Ned, why are you always right?" The word "other" in Robert's ability means that Robert gets +1 strength for each kneeling character, not counting himself. It does NOT mean that Robert himself must be kneeling in order to get the strength bonus.